On eBay, when you click the Advanced Search link to the right of the Search box, the Search page appears. It’s the most basic of searches (with a few options) and the one you’ll be using the most. When you use any of the Search options on eBay, the search engine looks for every listing (auction or fixed-price) that has the words you’re looking for in the title (or the description if you specify so). The title (as you may expect) is a group of keywords: words used to describe the item. 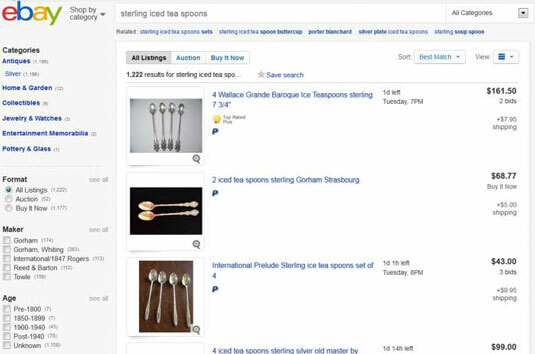 For example, if you’re looking for an antique sterling iced tea spoon, just type sterling iced tea spoons into the search window. If someone is selling a sterling iced tea spoon and used exactly those words in his or her title or description, you’re in Fat City. What price range you want to see: Type the price range you’re looking for, and eBay searches the specific range between that low and high price. If money is no object, leave this box blank. Words to exclude: If you want to find a sterling iced tea spoon, but you don’t want it to be plated silver, exclude the word plated from the drop-down menu. Within a category: Use this option if you want to limit your search to a particular main (or top-level ) category, for example, instead of searching all eBay categories. But why? eBay sellers are notorious for making listing mistakes and selecting wrong categories. Wait till you see your results, and then decide whether you want to narrow things. The item location: You can narrow your search to the United States only, North America, or worldwide. Depending on your item, this search criterion can help weed out the most esoteric items. If you’re looking for hefty items (like an elliptical exercise machine that will probably end up as a place to hang clothes) that would cost much too much to ship, you can specify how many miles from your ZIP code (or any ZIP) you will allow the search to extend. The order in which you want your results to appear: If you indicate Time: Ending Soonest, the search engine gives you the results so that items closing soon appear first on the list. Best Match is the eBay default, but you should select a sort that better fits your needs. Time: Newly Listed lists all the newly listed items. Price: Lowest First and Price: Highest First list them just that way. Whether you want search to check through item titles alone or check both item titles and item descriptions: You’ll get more hits on your search if you select the Include description check box, but you may also get too many items that are out of your search range. 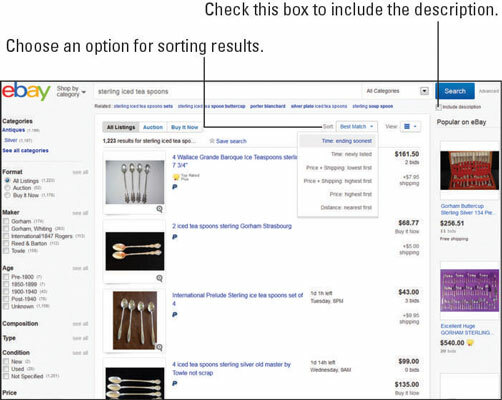 You may notice that eBay has a way to refine your search in boxes to the left of your results. Be sure to click the related specifics here because eBay’s search functions can often be a bit temperamental — and you don’t want to miss any great deals. Next to item listings you often see pictures, or icons. A golden yellow rising-sun picture means the listing is brand new (this icon stays on for the first 24 hours an item is listed). The gold seal with the words Top Rated Plus indicates an item is being sold by a seller who gives top-rated service on eBay. An easy way to keep track of an item you’re interested in is to click the Add to Watch List link just below the current bid amount of an item page. The listing then appears on your My eBay Watch List, and you can keep your eyes on the action. On the left side of the results page may be a list of categories that your search term is listed under, which is a great reference. Next to each category is a number in parentheses that tells you how many times your search item appears in that category. The figure shows a sample of the category spread. To view the items appearing only in a particular category, click that category (or subcategory) title.